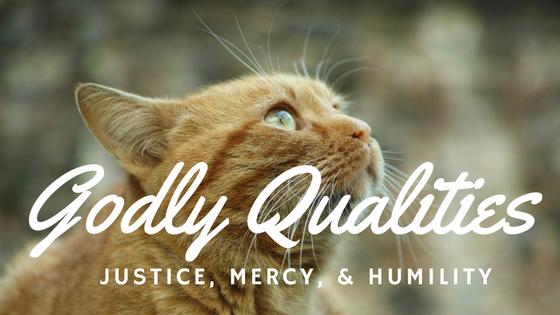 3 Godly Characteristics – Justice, Mercy and Humility! An awareness of good and evil resides in us all; with that knowledge comes a tendency toward judgmental attitudes. God calls us to three godly principles: justice, mercy and humility. Personally, justice dominates; mercy is lacking, while true humility is a work in progress. I was chatting with a preschool teacher a little while ago. She was welcoming new students into her class. They are rapidly learning the behavioural expectations of their new environment. The older students are quick to inform her when one of her new charges is going astray. We chuckled at how easy it is to point out someone else’s faults, even though it may be the only moment in the entire day when we ourselves are actually obeying. It isn’t just children that fall into this trap! “He has shown you, O man, what is good. What does justice look like where the guilty face the consequences of their actions, while victims are restored their rights and dignity? God has made the distinction between right and wrong clear in His word and even within our hearts. Before we allow intellectual reasoning unruly access, God’s requirements are obvious, even as these little preschoolers demonstrate. Justice is an action! It is something one pursues and does! I immediately want justice when it is me that has faced offense or some kind of violation, even is minor. Yet, when I have crossed the boundaries of honour into the quick-sand of indifferent regard, I’m not so fast to press for that same justice. The only way justice truly works is when it is mixed with a healthy dose of mercy. The two form the right and left hand of godliness. That is a verse I have quoted many times; perhaps I should say, misquoted in part! Usually this is as far as I would go! I honestly did not know the rest of the verse by memory. How about you? I may seem innocent and humble in my own eyes, at least until the Holy Spirit speaks! The more Holy Spirit uncovers the secret thoughts and condition of my heart, the more disgusting I find it is. Who truly “knows” my heart? The answer is, God does. Yet, He is willing to look inside and show me the contaminated contents as well. If my heart lies, I will know it; if my heart accuses, I will know that too; but if my heart is deceived, I will not know it unless God reveals it. It is through humility that lies, accusations and even deceptions are revealed for what they truly are. We can sometimes misinterpret humility as weakness; it is in fact stronger than justice and mercy combined. It is humility that keeps my proud nose pointed in the right direction recognizing my own need for transformation, rather than blindly upward. One of the toughest places to demonstrate true humility is in the face of injustice, where the cup of love of mercy appears empty. Actually, when I reverse the order and put humility first, when I recognize my security in the Father and Christ in me, humility begins to flow rather naturally. Humility, mercy and justice are more than requirements, they are release agents of God’s goodness. Arrogance has not room in the Presence of God – none! Out of the relationship of love and mercy, love and mercy finds a free flowing channel to influence others. This sweet delicate flow makes wrong things right! Justice begins to naturally invade attitudes and circumstances. No matter which way you say it – justice, mercy and humility, or humility, mercy and justice – they form a torpedo sandwich catapulting a powerful momentum of strength and dignity into our lives and the lives of those around us. A requirement is something that is most needed and wanted; it is a necessary condition. God who made us in His own image, says justice, mercy and humility are necessary ingredients for us to re-present Him to our wounded world. May my life be one that actively pursues justice, generously loves and consistently extends mercy, and gently walks in humility, that I might pattern Christ more fully. ← The Prodigal Returns, Prayer Answered! Running No More!